At just over a half-inch high and weighing 1.3 lb., it is lighter than an iPad and small enough to slip into any kind of travel bag or suitcase. It is powered and upgradable via a single USB cable, which is included. 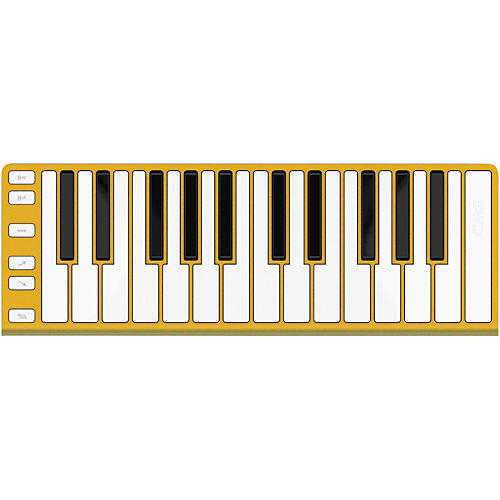 It features 25 full size keys, velocity sensitivity and polyphonic aftertouch along with Octave Change, Pitch Bend, Modulation, and Sustain function buttons. When you’ve made a commitment to Xkey, Xkey makes a commitment to you. Benefit from upcoming new features by upgrading your Xkey online. Constant updates means constant cutting edge performance. Limited warranty: All the content and specification in this manual are for reference only. Central Music Co reserves the rights to modify the manual, but dose not guarantee to notify the modification to anybody. Central Music Co also reserves the right to modify the product specification without notification to anybody, thus there may be difference between the real product and the manual. Central Music Co will not be responsible for any third-party products. Central Music Co offers limited warranty to the original purchase user, that is, there is no material or assembly defect within the warranty period. The warranty period starts from the purchase date. For the products with defect found, the user should send the product back to Central Music Co within the warranty period with shipment cost paid; Central Music Co will repair or replace the defective products for free. When sending the products, the user must use the package box supplied or confirmed by Central Music Co, otherwise the warranty will be invalid. For the shipment cost, the user covers the shipment cost from its place to Central Music Co, and Central Music Co covers the shipment cost from Central Music Co back to the user. Please contact Central Music Co (Tel: 8610-8580 1115) in case you need warranty service, and you need to provide with product serial number and your purchase warrant (invoice or receipt). Any modification or appendix to the warranty must be confirmed by Central Music Co or its dealer or agent before it becomes valid. All of the above terms and other items not mentioned in the warranty, whether oral, written, declared or implied, are invalid. Central Music Co denies all the implied warranty, including (but not limited to) those warranty for sales, for some special purpose, or for anti-tortious purpose. For anything out of warranty or any other damage or cost whether special, indirect or related, including (but not limited to) data loss, income loss, production stop, fame, device or property damage, or cost for get back, re-make, copy any program or data from the product, Central Music Co pays no responsibility to them. For some region where responsibility exclusion is not allowed, the above limit or exclusion may not be suitable. With the warranty, you will have all the legal rights and other rights with your region.